Happy 20th birthday, Crystal Jade! Yesterday, I had the pleasure of meeting Mr Ip Yiu Tung, Chairman and CEO of Crystal Jade Culinary Concepts Holding. You'd never believe with Crystal Jade's tremendous success that he previously had no F&B background. In fact, he was in semiconductors, clocks and watches (his watch company went public in 1995 with annual profits of HK$43 million), and then he switched to piano manufacturing. 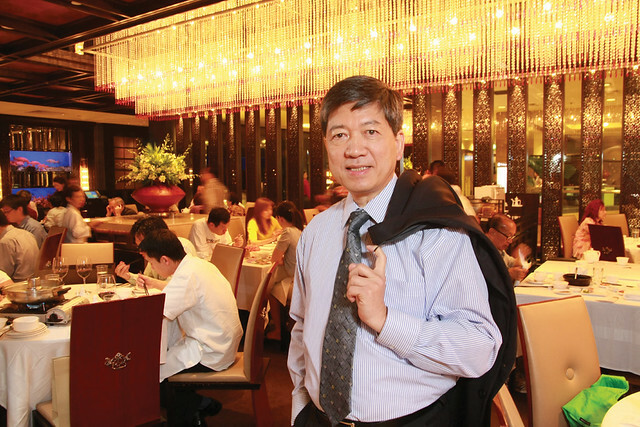 In 1992, Mr Ip invested in the new but underperforming Crystal Jade restaurant in Cairnhill Hotel, and turned it around. But success didn't stop there. Twenty years later, we have 100 Crystal Jade outlets in 18 cities over 9 countries, with numerous dining concepts. And in 2011 alone, Crystal Jade is investing S$12 million and opening 22 branches here and abroad. That is phenomenal growth, given that several Hong Kong brands have tried and failed in the F&B scene here. Mr Ip is very astute. He saw the difference between diners in Singapore and Hong Kong. Locals here may love food just as much, but are a lot more value-conscious. Moving forward, Crystal Jade is evolving its brand to reflect a more contemporary image, and its focus on authentic traditional Chinese food with contemporary flair. This is Crystal Jade's new logo. When I saw it on the restaurant signboard, it felt like this had been the logo for years, and I could not recall for a few moments what the old logo looked like. The English font is lovely, isn't it? It was specially created for Crystal Jade. I also like the use of regal colours purple and mustard yellow. The purple represents passion, and the yellow reflects royalty and warmth. No more green. The new look was unveiled at a media lunch which was very well-attended (The Straits Times' Wong Ah Yoke was there!) by both online and print media. 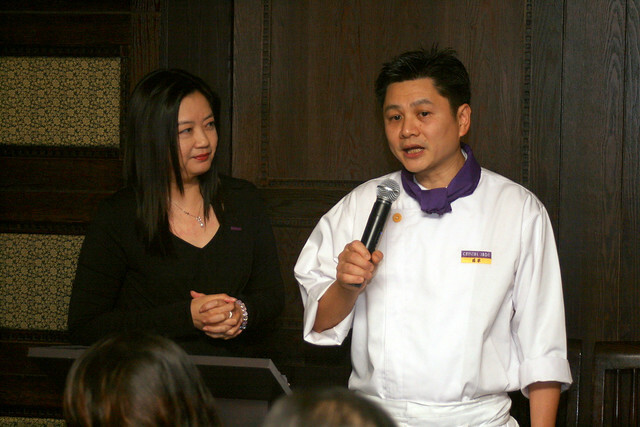 Here's Stella To, Crystal Jade's Vice President of Corporate Communications and Marketing, with the Executive Chef of Crystal Jade Golden Palace who came up with the new dishes (I see the corporate colours even trickle down to chef uniforms). We got to sample six of the new dishes. Stella gave us detailed introductions to each dish, including the ingredients and preparation. First up, a combination of two cold starters. Marinated Pig's Knuckle and Pickles Wrapped in Lettuce. 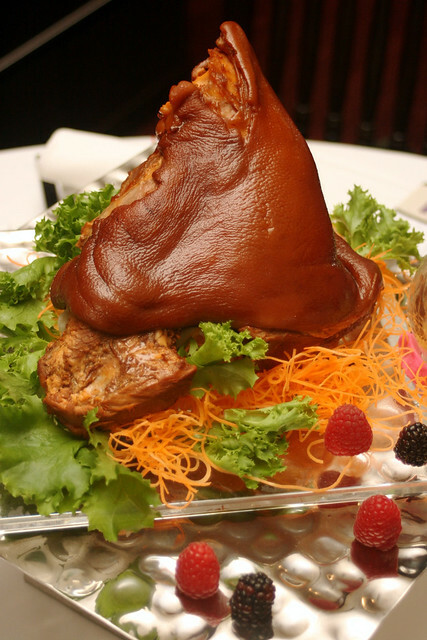 The traditional Teochew marinade includes herbs like cinnamon bark, illicium verum (star anise), fennel fruit and premium Chinese rose wine. The pickles add tangy crunch to the marinated pork. Cold Lobster in Teochew style. 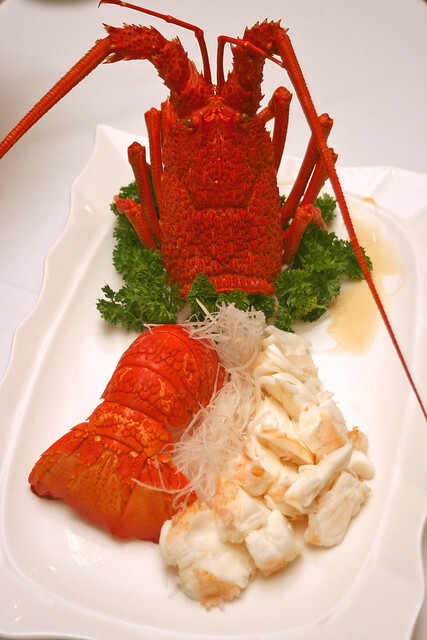 Live Australian lobster is poached and kept at room temperature for 1.5 hours until it is cooled. Ironically there is no chilling involved in this cold lobster, but this is an authentic Teochew preparation method that keeps ingredients fresh. Not much seasoning is required. The two photos above are how the dishes are presented for big groups. 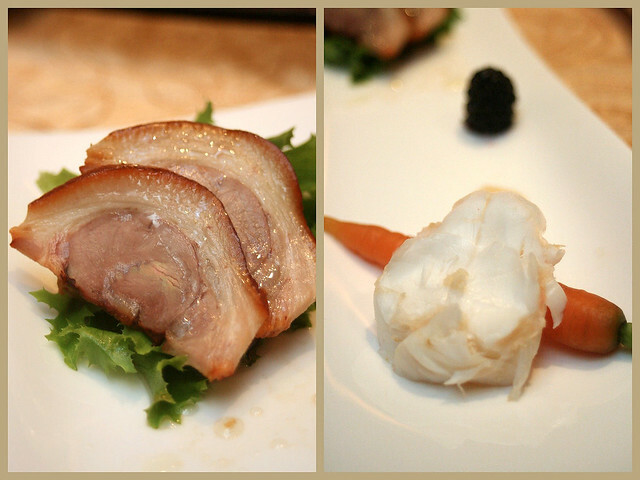 This is the individual serving portion of Marinated Pig's Knuckle with Pickles wrapped in Lettuce; and Cold Lobster in Teochew style (S$32/serving). Double-boiled Sea Whelk and Chicken with Starfruit and Pomelo (S$20/serving). This is a delicious tonic. It felt warm and fortifying as I drank it. It's recomended for busy working adults (especially those who lack sleep) who need nourishment that's not heaty. Live sea whelk (airflown from Vietnam) is sliced and boiled for 3-4 hours until tender. 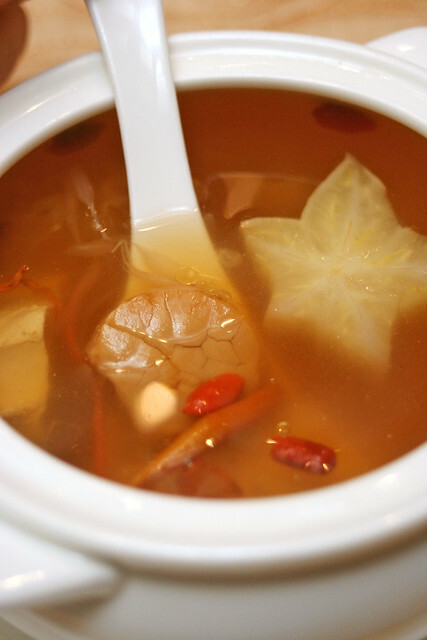 The soup also has chicken, conpoy, cordycep flowers, dried longan and wolfberry. Starfruit and pomelo are added for a hint of fruity aroma. 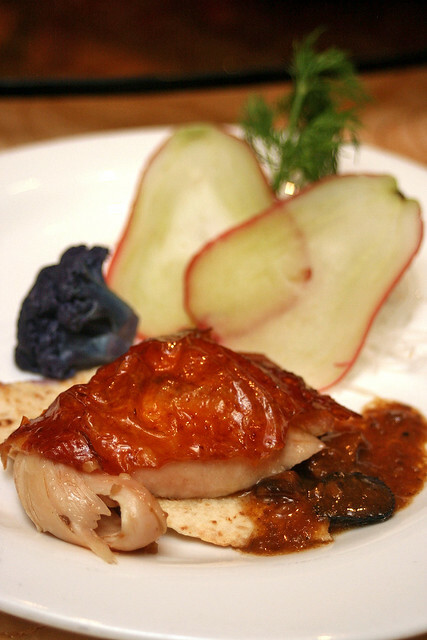 Deep-fried Chicken with Black Truffle (S$80 for whole chicken). Sliced French black truffle, mushrooms and virgin olive oil lend an almost Western taste to this dish. 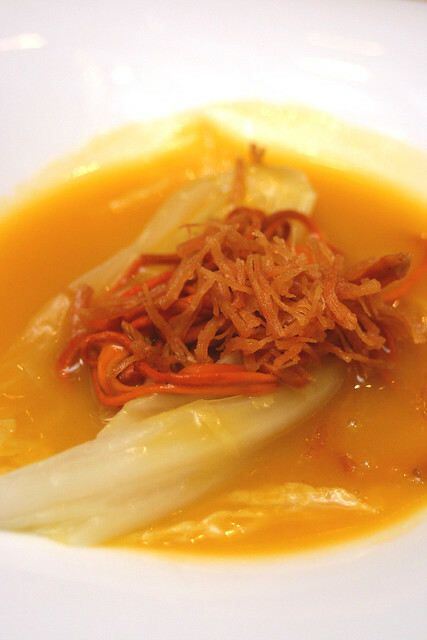 Simmered Cabbage topped with Cordycep Flower in Pumpkin Soup (S$22 for small). Pumpkins are not new to Chinese cuisine, but pureed pumpkin is not often used, it seems. But the pumpkin adds not only sweetness but fibre to the dish. 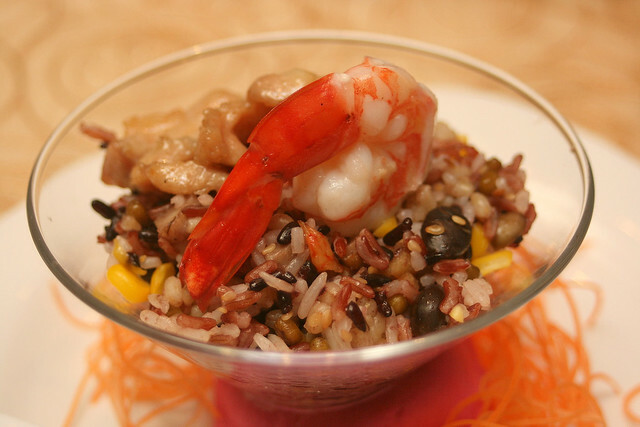 Steamed Assorted Grain Rice with Prawn (S$20 for small portion, good for 2-4 persons). Oh I absolutely loved this! A mixture of ten ingredients - white, brown, red, black glutinous rice, wheat, black and green beans, sesame, sweetcorn and diced taro/yam - are individually prepared (each requires different steaming time) and then mixed with sauteed prawn, dried shrimp, chicken and mushroom. I do like nutty grains, beans and cereals, so this was really something right up my alley. The Chairman Mr Ip contributed the recipe to the menu! He also cooks, but only for his daughter - ahh, can I be adopted too? Chilled pea cake is apparently a favourite dessert of the Empress Dowager Ci Xi. It's not widely available as it takes a lot of preparation. You have to cook the beans until they become a puree, mix them with other ingredients and then stir-fry them non-stop until enough moisture is lost. And then it needs to be chilled before cutting into the desired shape. I have never tried this before - the texture was so smooth and fine! Almost like a pudding but even lighter. Tastewise, it's not too sweet. 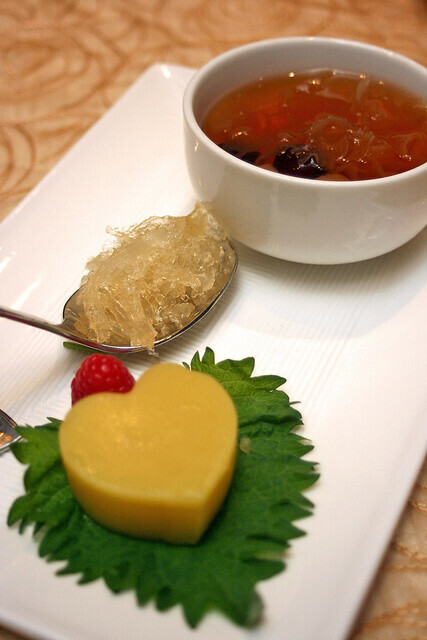 The sweetened soup of hashima, dried longan, lotus seed, ginkgo and bird's nest, on the other hand, is very sweet. It's to carry that dessert-spoonful of bird's nest, which is nothing short of divine indulgence. Bird's nest does help promote better skin (yes, I have seen its effects). Good for lungs and voice too. These new dishes are available at Crystal Jade Golden Palace at Paragon. I'm happy to note that there is also an increasing trend towards healthier dishes at Crystal Jade (some of them are endorsed by the Health Promotion Board). They also add more vegetables as edible garnishes for more fibre. 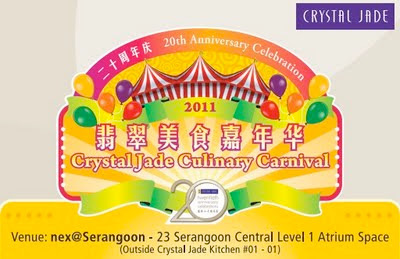 To commemorate its 20th anniversary, Crystal Jade is also organising a Crystal Jade Carnival at NEX, Serangoon Central from August 5 - 7. There will be lots of activities, live demos, and of course, food! All profits from this event will be donated to World Vision, which Crystal Jade supports as part of its community outreach efforts. Many thanks to Geri Kan of Linea for the invitation, and to Mr Ip, Ms To and team for hosting the lunch. Mr Ip's photo above is courtesy of Crystal Jade.